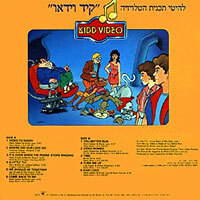 The end of each Kidd Video cartoon included a live-action music video with original songs. The cast did sing the original Kidd Video songs themselves. In addition, Robbie Rist and Bryan Scott also played guitar for a couple of tracks, and Bryan Scott wrote one song ("Time"). An album was released (on vinyl and cassette) in Israel in 1986 on the CBS Records label (the cast of Kidd Video also toured there in 1987.) The front cover of the album has a big color picture of the band, and the back has a cartoon picture of the band in the Flipside. This album was never released in the United States. This album was never released in the United States or on CD. But you can download the MP3s here to create your own version. This is a 50 MB ZIP file of all 11 songs. Individual song files are also available on each song page.